Beyond the opening heavy doors, artificial light lit up the interior. In the vast space that depth could not be perceived, large storage shelves could be seen stacking up like mountains. The warehouse in the late night gave off an inorganic atmosphere. In the corner of such a place, a slim young man with messy hair was sitting on one of the empty shelves. Belonging to the same Kuusen Madoushi Division second year sophomore, a guy with golden hair ── Lloyd·Alwin finally found his presence. "I was thinking of eating together with you once in awhile, but what are you doing in this place?" "Ah, Lloyd. Nice timing, take a look at this." As the young man, Kanata, sitting on the shelf said so, he then tossed over a bundle of ten or so documents over. As Lloyd flipped through the pages, his expression gradually became serious. "You should understand just by looking. This is the comparison summary between the warehouse item list and the actual inventory." "You say inventory so easily......"
While saying that, Lloyd looked at the artificially illuminated storage shelves that gave a hallucination of stretching endlessly. "I feel that recently the food supply in the item list does not match the actual inventory, so I lightly punished those Machina Division students that broke the warehouse lock and sneaked in. Then, as the purity of Mithril has also dropped, I have made a complaint to the Industrial Division." It might sound like a matter of course, but the actual issue was not so simple. The food supply in this warehouse provided for the whole city’s residents. Six thousand people depended on it for their daily meals. Even an amateur like Lloyd could guess that stealing a little amount should not be noticeable. "I didn’t see any other personel in charge of the warehouse, did you finish checking the entire inventory by yourself?" "Huh? Why do you even ask such an obvious question? How can there be anyone that would help a traitor like me?" "Sticking to being alone until this extent is also amazing. Since you verified this quantity of content alone with ease......Speaking of which, there have been rumors about you helping the Logistics Division because you are preparing for division transfer. Are you aware?" "No idea. Rather who would purposely help out half a year just for division transfer?" "Kanata’s behavior has always been hard for people to understand. More than half of what you do and accomplish are shocking, causing people to misunderstand. That personality of yours for not clearing up the misunderstandings is worse." Not telling me about that incident for example. He wanted to blame him for how Yuri felt, but kept it in his heart after noticing that Kanata also had some thoughts. "From what I can see, there are over 7000 items in the warehouse. There is no sane person that would do such an insane act of making an item list summary and managing all these by himself." "No, I am perfectly sane." "Then the sane Kanata is insane." "You trying to pick a fight?" "Hahaha, I'm just kidding. That aside, let’s go eat dinner. Kanata will treat." "Huh? Why do I have to treat you?" "This is the price for having one of your only few friends search for you all the way here. It’s only natural." The sudden appearance of humanity’s nemesis ── Magical Armoured Insects. Records show that they suddenly appeared about four centuries ago, the source of their origin was undetermined to date, there was still no theory to explain why a creature that had undergone such a huge evolution like that could exist. Just that against the Magical Armoured Insects, possessing supernatural powers named Curse, humanity’s conventional weapons could not repel them and the one-sided slaughter continued before eventually losing their land. Also, not only did they slaughter, people killed by Magical Armoured Insects would have their memories robbed and erased from the people who knew them, such was a cruel yet benevolent method. Then, born from the final power wrenched out from the humans who lost their land ── Floating City ── was the name of cities that floated in the sky. The land in the sky that humans survived in; the cities that combined magic and science. The upper part contained the hollowed out city from the ground, and a huge dome covered the outer layer. Supporting such a city was a giant floating stone roughly cut into an inverse triangular shape and a enormous Toras made from Luna Titanite that continued to revolve slowly. In addition to the surface facilities people live in, various types of factories filled the underground, allowing people to carry out economic activities just like the time when they were on the ground. And then the guardians of the sky exist in these cities. Amongst the majority of population that would lose the memories of those killed by Magical Armoured Insects, they were the few existences who would remain aware of the dead. They were also born with magical power, allowing them to fight against Magical Armoured Insects with their own body. Roaming freely in the sky, humans born to exterminate humanity’s nemesis, Magical Armoured Insects ── Wizard. Protecting people from them, retaining the memories of their dead comrades, they were existences born to carry on their sadness. The Wizards who specialize in protecting the people were called Kuusen Madoushi, they were important treasures to all Floating Cities. However, their numbers were absolutely insufficient, hence humans created a Floating City with facilities specialized in nurturing Kuusen Madoushi. Its name was ── The Floating Academy City 「Mystogan」. The special teaching facility for nurturing Kuusen Madoushi to fight against Magical Armoured Insects. The morning sun that shone from the dome wall showered onto the badge pinned on the collar of a yawning Kanata, engraved with a symbol that resembled a long extinct wolf and the words ‘S128’. It was probably because of helping out the Logistics Division until late last night. The path from Kuusen Madoushi Division’s Artemia Dorm to school that was not far felt longer than usual. One month had passed since the new semester began. As the freshmen in the surroundings were more or less adapted to the environment, he was lazily strolling on the stone path lined with conifer trees. Just then, a silhouette came rushing forward from the other end of the turning road. When he noticed, his vision was already obscured by the incoming silhouette. Then he was knocked back by the vigorous force with a don!, and his messy hair scraped the rough ground. Kanata who was lying face up on the ground after being bounced away craned his neck to look foward while enduring the stinging pain. Before him, a girl with bright red long hair was in his sight. The red-haired girl was straddling him. Not to mention Kanata’s hands just coincidentally pushed upwards from the place below her chest. He shifted his line of sight upwards a little. Their eyes met. On top of being late in realizing where he was touching, the two mounds were still unnoticable. However, as a guy he would still be conscious of it. Feeling awkward, Kanata tried to pull his hands away casually, but the red-haired girl shook them off forcefully. Kanata’s head was once again slammed onto the ground hard just when he got up. So unreasonable. The girl was shorter than Kanata as they both stood up, her uniform was also different from the sophomore Kanata’s. Probably a preparatory junior. But, she was glaring with truculent eyes without any concern for seniority, a spirited girl. Kanata who just got up rebutted while rubbing his head that was still tingling with pain. He felt something strange at his lower body, but the pain from the head took priority. Glaring at him with sharp eyes, the red-haired girl would not let Kanata off. However, for some unknown reason, the red-haired girl’s sharp glare suddenly loosened, instantly losing her dominance, shock and confusion then began to show in her expression. Shifting his eyes, just as the girl mentioned, a soft-looking toast was sticking onto his crotch area with the jam side. Her long bright red hair swayed in the air. The girl reflexively tilted her body back without thinking. This was probably an obvious reaction. The toast that stuck onto Kanata’s crotch fell off just then, causing her to notice the red stain surrounding the zip of his pants. This girl definitely did not hear what I said. She had switched into victim mode completely. The red-haired girl cried for help towards the surrounding passersby after regaining her composure. Though the girl asked for help from the surrounding, nobody came to help her. Just as the girl turned around feeling suspicious, only a toast was there lying on the ground, the young man had already disappeared. Kanata took off his pants at the washing bay built next to the wall of the Training Ground. While washing it, he was only in his trunks. Just at that time he sensed someone’s presence on the other side of the washing bay. Kanata was rendered speechless from what he saw. She had beautiful black hair, a pair of shining obsidian pupils. She had an upright nose on her prim and proper face, with a captivating body line that was sensational even with her uniform on. As if a famous sculptor spent his whole life to craft this masterpiece of a human sculpture, anyone would be captivated by this goddess-like girl after seeing her. Such a rare beauty was staring at her reflection intimately from the nearby dressing building window glass as if devouring it in a trance-like state. She smiled as though overjoyed about her appearance. She closed in towards her reflection in the window glass to almost kissing distance while seemingly bewitched. As Kanata witnessed this bizarre scenario, he thought that he absolutely would not want to have such a friend. As Kanata rebutted with amazement, he thought to himself ‘what a waste’ for this girl. That Goddess girl brushed her hair again like a rich family’s daughter. A fragrant scent wafted through the wind towards him. With Kanata’s eye contact with her, she once again smiled. A beauty that could captivate any being. Leaving personality aside, Kanata’s heart skipped a beat from seeing her. She brushed her hair once more. She crossed her arms and closed her eyes as if drunk on her beauty, walked closer with that intelligent and elegant atmosphere. As she was about to say the decisive words right before him, her voice trailed off into a shrill scream towards the end. She had just noticed that Kanata was not wearing any pants, only in his trunks. It seemed that due to the location being covered by the washing bay’s shadow, she did not see what Kanata was wearing on his lower half. Rico showed a face of not knowing what to do without any disguise, her pretense before had completed collapsed. However, Kanata who did not mind having his lower half seen nonchalantly said. After that. As Rico started screaming at Kanata out of distress, Kanata hurriedly grabbed his wet pants and fled the scene. Kanata, who ran into the dressing building next to the Training Ground, sighed as he saw some red stains still remaining on his wet pants. As he snuck through the facility’s opened window, it seemed like he had entered the toilet. He used the body that was constantly trained, as well as the unlimited potential of a human during an emergency to escape here. But as the saying goes, never two without three. It could be said that his mood plummeted after meeting two weirdoes in a row today, his attention was unfocused. He still did not realize what place he had infiltrated into. Still, it was lucky that he infiltrated the dressing building. There would be washing and drying machines designed to wash the Kuusen Protector in this facility. Kanata decided to head to those machines and wash his pants. Kanata was walking towards the exit of this toilet full of white cleanliness. Just then, the third incident occurred. The toilet door was opened, a blonde-haired, blue-eyed and white-skinned girl was walking towards Kanata. She probably just came from training. Towards this girl wrapped tightly with her inner suit, Kanata who was suffering from light gynophobia used a threatening tone. Since he already had two experiences on this ominous day, he suspected that any girl he would meet that day would be a troublesome character. However, this blonde-haired, blue eyed girl seemed to be different from the eccentric girls he met, she seemed to be quite docile. When she just met Kanata and made a quick eye contact, the girl shrank back from being overwhelmed by his attitude. Looking closer, the girl was much shorter than Kanata, and was looking up at his reaction with an almost crying expression. Although the saying mentioned about the third time, it seemed like this girl was quite normal. Kanata lowered his guard. The girl shifted her sight to the ground, moving only her lips. The girl moved her lips again, but the voice that came out was too small to hear clearly. The girl’s shoulders were trembling, as she was trying to convey her words on the verge of tears. 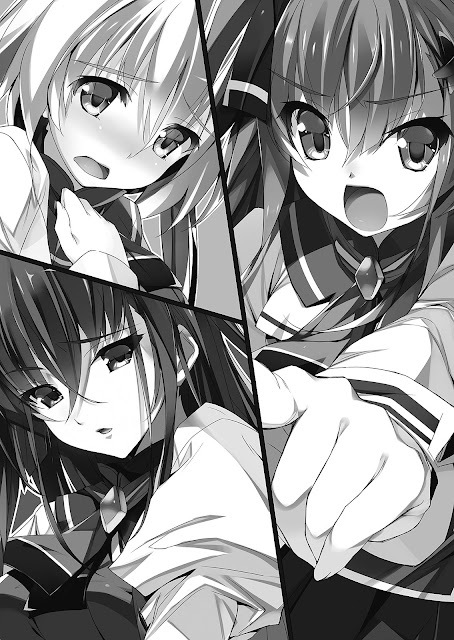 She said some more things, but due to speaking while keeping her head lowered, Kanata was unable to hear them. He let out an irritated voice. Immediately, the fairy-like small body of the girl shrank further. She used her small and delicate hand to stretch her inner suit lower. Kanata waited for the girl to return to normal impatiently. The only exit of this toilet was blocked by this girl, he could not leave even if he wanted to. After a long silence. The girl seemed to made up her mind about something and raised her head to speak. After finishing her words, the blonde-haired, blue eyed girl looked at Kanata who was wearing just his trunks at his crotch and feeling awkward about the situation, her whole face reddened from embarrassment, timidly asked while looking up at him. With that, Kanata·Age’s second year sophomore life began. The Wizards who were originally one out of ten in the Floating Cities took up over ninety percent of the population here, and the total population was six thousand. About ninety percent of the citizens were students, that was why the Wizards there were one out of ten in other cities held up to ninety percent in 「Mystogan」. It was an Academy City that utilized a motto of student self-governance, including education for the three-year Preparatory course and the three-year Sophomore course, providing schooling for students aged from twelve to eighteen. Due to the fierce battle with Magical Armoured Insects, thirty percent of the Wizards belonged to the Kuusen Madoushi Division, other divisions included the magical technology research division Alchemist, scientific invention-focused division the Machina and other divisions totalling of nine divisions, the head of each division along with the Academy overall-in-charge made up the council of ten that was the school’s upper echelon. Amongst the divisions, the Kuusen Madoushi Division not only held the fate of this city, it could even be said that they held the fate of the world. People held such expectations to them. Picking out the potential seeds of Kuusen Madoushi from the floating cities all over the world and gathering them here to nurture them, their goal was to develop the future protectors of the world. Kanata arrived at school late due to extra effort spent on cleaning his pants, the two people that were talking on the linoleum passageway turned their attention on him. The two stopped their chatting and focused their attention on him, and for some reason a silent and nervous atmosphere was created between the two sides. One of them recognized Kanata, Kuusen Madoushi Division Sophomore first year girl ── Yuri·Flostre turned a hostile stare at him. She purposely used a sarcastic voice to speak. A tied-up deep blue hair, with crystal clear emerald eyes. Although she was not tall, her proper behavior gave people a high class rich lady impression. In truth, she was earnest and helpful, and received good evaluation from her peers, but she showed hostility towards Kanata here. He scratched his head and replied nonchalantly. Even though the junior who once relied on and admired him was now full of enmity. Though she said so from her mouth, there was not a day Yuri did not think about that incident. On the day of the decisive match to determine the strongest squadron in 「Mystogan」, Kanata was absent without reason. And after that, he did not participate in any squadron activities. As the Royal Guards they were respected by everyone, even when he was in the position of betraying everyone’s expectations, he did not care at all. He lightly provoked. Despite Yuri desperately trying to suppress her feelings, it was still obvious to the eyes. Just when Yuri was about to rush towards Kanata. Chloe prevented the fight that almost broke out. As he commented, Yuri shot a glare full of hatred at Kanata again. Yuri walked away from the scene while clenching her fist tightly. The captain of S128 Royal Guard nicknamed 「Nirvana」, a girl with long black hair tied into ponytail with a thin lavender ribbon ── Chloe·Sevegny watched her leave and then showed an unhappy expression to Kanata. As Kanata sloppily commented, those words almost escaped Chloe’s ears. She stood before him who was trying to walk off to the classroom, and made an eye contact without blinking. Kanata said so while scratching his head in annoyance. Chloe pouted and turned her head away in defiance. Then she switched to a serious expression, spoke with lowered eyes. Kanata expressed so with a carefree attitude. Then he continued nonchalantly. Showing a glimpse of fearless smile as if it was a matter of course, Kanata spoke so. Chloe could only smile wryly at his style. The fourth class bell rang right at that timing, the two of them hurriedly walked back to their classrooms. The Kuusen Madoushi Division education included not only the common academic knowledge and specialized knowledge, but also the obligation to train their bodies, researching day and night to meet their expectations. This was not limited to the Kuusen Madoushi Division, the freshmen of all divisions had their morning lessons mainly focused towards common academic knowledge, more specialized knowledge would be added as they advanced in years. Other than that, the afternoon was mainly focused field practices. Many students were enjoying their lunch breaks at the learning building they often sparred in. Another large group of students were walking towards the cafeteria on the first floor of the school building, while Chloe was dragging a frowning Kanata by the sleeve and walking away. Soon they arrived before the Kuusen Madoushi Division Head’s office, Chloe knocked twice. Chloe entered the room after saying that, with Kanata following behind. Inside the room, many Kuusen Madoushi Division related data and books were stacked on top of the working desk. As for the person sitting at the other side of the desk, a head of black hair and a glamorous body that was obvious beneath her uniform, with a tear mole under her left eye, the girl who was the Kuusen Madoushi Division Head ── Feron·Flamel’s figure could be seen. Facing Feron’s self-satisfying sarcastic words, Kanata replied normally with no change in expression. As her words ended, Kanata received the letter of appointment. The first page recorded the job title he would be posted to and its details, the second was the content page of those thick files on Feron’s desk. Kanata frowned in irritation and involuntarily asked. Hearing the content of the appointment, Kanata’s expression turned even more cloudy. With a face devoid of motivation, he sighed loudly and continued. Ignoring the grumpy Kanata, Feron probed for Chloe’s response. Chloe who showed a grave expression for some reason immediately started to persuade Kanata. She showed an angelic smile while saying that. Kanata lost his grumpiness and asked back instead. Feron could not understand the conversation between those two and felt like being left out, it seemed that it was something only the two of them knew. Kanata then picked up the thick file of the member list to read through. While reading, Kanata’s expression turned grave. As if receiving some shock, Kanata took his eyes off the member list. Then he continued to browse through the other thick files silently. E601 was not simply weak. It was extremely extremely weak. Despite the new semester only started one month ago, they had ten lose streaks in the E-rank ranking battle. Ranking battle was the mock battle between squadrons against imaginary Magical Armoured Insects, and they had a streak of ten loses in the lowest E-rank, if they were engaged by real Magical Armoured Insects, the possibility of returning safely was ── minuscule. He hugged the thick files of data, and then suddenly started walking out of the office. He replied while his back was still facing them, then left the place without looking back. After confirming the door was closed, Feron could not help but ask. 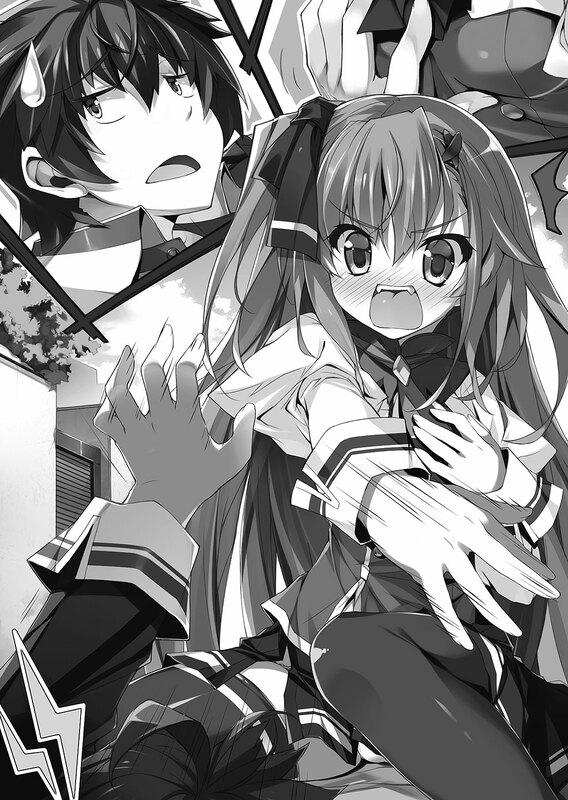 Then Chloe leaked out some of Kanata’s past in the name of childhood friend. Putting aside Chloe who was full of confidence, letting that elusive and hard to understand Kanata become an instructor, Feron still felt a sense of uncertainty. The lesson after lunch break ── Practical training. Other divisions focused in activities regarding economics and productivity of the city, while the Kuusen Madoushi Division received the support of others and focused on training. The Alchemist Division used the magic formulas created from the twenty-five rune symbols to produce Mithril armaments, Industrial Division students worked hard to produce food that were highly nutritious and high in productivity, all to support the Kuusen Madoushi Division. The Kuusen Madoushi Division was just that important and held with much expectations at the same time. Kanata walked towards the squadron building next to the main school building, passing by many Kuusen Madoushi Division students wearing protectors. The students were laughing while gossiping in groups, there was no trace of killing intent in the atmosphere, yet these students must learn the skills to fight against the humanity’s nemesis without any mercy. For the sake of teaching those teenagers with bright futures, Kanata opened E601’s room door, only to be treated as a pervert immediately. However, since Kanata had already seen their faces from the profile in the office, he was not so disturbed by the fact. The worst first impression. 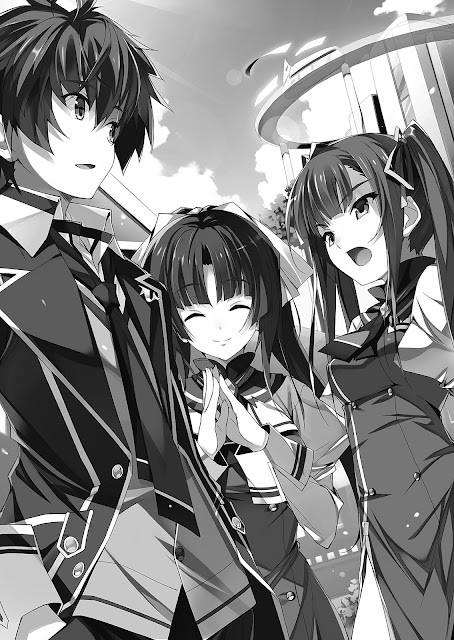 The girls before him were the three girls that had the worst first encounter with Kanata. However, Kanata already knew this beforehand, so he was not shaken, and continued naturally. The one saying those things with an overbearing attitude was the bright red long hair girl. Towards that girl, Kanata did not even look at the profile in his hands and replied in her face. Being stared at by Kanata, Misora seemed to feel guilty yet offended, but still hung her head that was dyed red with embarrassment down in the end. She wanted to return the stare back at Kanata......but could not. Receiving an E grade in the practical test, it was same as fighting on par against a single small-type Magical Armoured Insect. When Kanata wanted to probe deeper into the reason her ability was so poor, the flawless beauty interrupted. After humming a small laughter through her nose, Rico stroked her hair like a rich family’s daughter. Kanata stared at Rico again, but she did not display any embarrassment like Misora. She seemed to firmly believe that a Goddess such as her could not be evaluated by humans. She closed her eyes and hugged her arms, answered so rudely without even looking at Misora. It was a squadron formed from the leftovers of various disbanded squadrons, like Rico said there wasn’t much communication amongst them. And finally, Kanata looked towards the blonde-haired, blue-eyed petite girl that was waiting at the side for her turn nervously. She did not dare to make eye contact with Kanata, Lecty kept bowing as would a little lamb being scared of a wolf. Furthermore, the momentum from the bow caused her head to bang on the table, she held the painful area with her hand, with a face that was about to cry. The three each had their own troubles. Although without looking at practical training he could not determine their strength, but just the data alone he could understand why they were branded the F-rank squadron. But Kanata decided not to rely on data for gauging their ability, he still decided to go with practical training. Misora interrupted Kanata’s words unhappily. Misora pouted and wanted to chase Kanata away, but she could not come up with anything. As she was thinking of the words to say, she was distracted by another thought. After that Misora continued to mumble Kanata’s name a few times, then suddenly stood up from her chair. Rico also seemed to notice something, only Lecty had no clue what was going on. She pointed at him and mercilessly criticized. Originally this should not be allowed, as an instructor he should take a firm stand against her to maintain their student-teacher relationship, but. He responded carefreely, Misora bit her teeth and stared at him hatefully with eyes that wanted to kill him. Kanata chose to ignore Misora’s criticism, and announced to the students seriously. Fuu, it’s rude to say I’m surprised, but these three do have the motivation to work hard. He looked at Misora, Rico, Lecty, then told his students. Kanata’s cheek suddenly raised up in a confident smile. Misora who was staring at him was scared by it. He spoke with a carefree tone, but his eyes were not smiling. To find out if they have the determination, the room for growth, Kanata had to test Misora’s group first. Truthfully speaking ── She desperately wanted it. However the other party is a traitor, is trusting him easily like this fine? Misora was hesitating. At that moment Kanata seemed to see through everything. Being exposed like that, Misora who held a fervent desire to become stronger caved in. She was about to agree to let the traitor guide them. However, just at this timing. Rico began to stroke her hair like a rich family daughter again. She pretended to stand from her seat, but only moved out half a step, Rico treated Misora like a little idiot. Misora was furious at this act, but Rico treated it as if nothing. It was an atmosphere that the fight could break out anytime. Then, what would the last person here that was Lecty do at this time? Kanata stayed out of it and observed, Lecty seemed to be fidgeting from cowardice while sitting there......is it. She seemed desperate to do something but her lack of courage prevented her from doing so. Kanata had no choice but to step in between their arguments. Rico had already held absolute confidence in herself ── although he did not know about goddess or something, he still pretended to be surprised about her goddess-like attitude. Rico could not bear with it and argued while pointing at Misora. The phrase “below the level of Misora” echoed in her head. Being stared at by Kanata whose eyes suddenly became serious, Rico was at a loss what to do. For the time being, she promised to receive the training from Kanata who was called a traitor. As for the last, Kanata finally changed his attention to Lecty who was looking at the situation worriedly. Lecty’s face turned red from anxiety and lowered her head again. Being shouted at by Misora, Lecty nervously apologized and bowed, she knocked her head on the table again due to overusing her strength again. Trace of tears could be seen at the corner of Lecty’s eyes while rubbing her swollen forehead. She still could not maintain eye contact with Kanata, and immediately lowered her head again. Misora continued her question seriously. It was the same when arguing with Rico, Misora seemed to be the type that treat rules and discipline seriously. Lecty, with her head still lowered, spoke up with a slightly louder voice than just now. With that, Misora and her two other teammates decided to receive Kanata’s guidance. The Floating Academy City 「Mystogan」 flew at the height of around 3000m. Any higher than that would cause severe strain on the Power Reactor so it was forbidden. In the sky above 「Mystogan」 ── Misora’s team could be seen in the Third Training Aerial Zone located 4000m above ground. They were not standing on land, neither were they using the power of any items. The three of them changed into their Protectors and hovered in the air. This is the necessary flying magic skill Kuusen Madoushi Division students must learn first. The scenery around the girls were the endless blue sky and the cloud sea that could be seen far away, with the presence of other hardworking students flying in the neighbouring aerial zones. Below them was the 「Mystogan」 they had just left. Although it was not as tiny as a bean, it still looked small. Misora in her Protector tilted her head and asked. Amongst the four hovering in the sky, only Kanata was using the black-colored surfboard-shaped tool processed from using floating stone. The flying assist tool called Broom was used by freshmen for their flying magic training purpose, or originally used for long distance travel. Misora criticized him with a thorny tone. However, Kanata did not mind it at all. Grrrrrr. She was furious, but Misora still held it in and changed to the important subject. After being pointed out, Kanata scratched his head and announced nonchalantly. Misora and co. exclaimed at the same time. Eh, that kind of training is fine? That kind of training will make me stronger? Anyone would hold that kind of doubt. However, only Kanata remained aloof. Towards Misora’s team that showed a relieved expression, Kanata announced with a confident look. After his frank statement, the training began right after. Kanata immediately operated his Broom and left the place where Misora’s team was at. Misora’s team did not know that Kanata’s Broom, nicknamed ── 「Black Hawk」, which was customized, had three times the speed of the normal Broom......The girls that were ignorant of the matter recovered from their surprise soon after. Misora complained as if she just remembered something, but Rico who was crossing her arms besides her seemed to guess Kanata’s intention and leaked words of admiration. Before Misora could deny, Lecty timidly continued her claim. Rico remained silent while showing a face of realization. She could not deny that the encounter between Kanata and Misora also left her with a deep impression. She reluctantly acknowledged this fact. Misora felt that she was humiliated, she adjusted the magic power at her feet for quick acceleration. Lecty followed suit after being instructed by Misora, only Rico remained still. Misora felt strange and questioned her, Rico then brushed her hair like a high class lady and answered. Misora flipped out and flew straight towards the direction where Kanata went. As for Lecty whose existence was completely thrown out of her mind. She chased after Misora in a hurry. Rico looked at Misora and Lecty that were moving further away with despised eyes. As if mocking this scene, Rico snorted. Kanata who was levitating in the air showed a difficult expression, peeping at Misora’s team from far away. Suddenly being informed of the commence of training, whether the squadron leader could organize the team was also one of the important facts to confirm. After a while Misora flew towards Kanata with cruising speed. She faced Kanata while reducing their distance. It sounded arrogant, but Kanata himself never thought that he could get hit by their attacks. The attacks that came from the clumsy group of the F-rank squadron, even if he was the traitor, the former Ace of the S-rank squadron had no reason to get hit. It was understandable that she would despise Kanata for suddenly becoming their instructor. Kanata was unaffected by her hostility. He was used to such treatment. Immediately after her declaration, Misora injected mana towards the rune-engraved ring on her index finger ── Madoushi’s Magisphere. It reacted to the unique magic wave, then a giant sword appeared suddenly out of thin air. Seeing this weapon, Kanata narrowed his eyes in interest. Although it was a magic sword, a revolver chamber was installed on the hilt, and a muzzle at the tip of the sword. Kanata also used a giant sword with a cannon function in the past. However nobody used this kind of unbalanced weapon now and it was abandoned. Misora instantly closed the distance between Kanata, who was riding the Broom, and herself, she swung the white silver sword down with all her might. The giant sword swung down like a log and generated a splendid wind pressure that brushed Kanata’s cheek. However, he had already seen through the trajectory of the swing and lightly tilted his neck to dodge. Misora continued her sword arte. It felt as if the storm just went past him, Kanata’s surroundings were enveloped by a raging sword pressure. However, in the midst of this hellish battle, a dubious look appeared on his face as he thought of something. Misora swung her giant sword with her full might like the storm. Kanata seemed to be absent-minded, but still used deft footwork to operate his Broom to dodge like an acrobat. In this space with only an arm-length distance, the difference in ability as a Kuusen Madoushi between the two became obvious. Misora’s sword arte was more like “smashing” instead of “slashing”. It took a long time to store power, causing the slash speed to be slow. Hence, it was not suited for guerrilla fight using flying magic in the sky, not to mention that the giant blade of magic cannon sword hindered the movement of Misora’s delicate body. Honestly speaking, he could not bear to see Misora’s rough magic sword arte. However, Kanata was occupied in thought about another talent she possessed. To test whether his thoughts were true, he suddenly raised his Broom to max speed when Misora was not paying attention and pulled away. What Kanata displayed was commonly known as: Close Prevent. It was a tactic in which he accelerated in the same direction as his opponent, causing their relative speed difference to be zero, hence causing his opponent to be unable to close in. This meant ── Misora would not be able to approach Kanata at all. Regardless of the strength of the opponent, close-ranged weapon could not hit far away. Against Misora who wielded a Magic Cannon sword, this would be a fatal tactic......or so it should. But in the next instant, she already caught up to Kanata who used such a despicable tactic. What occupied his line of sight was Misora. She was already within arm’s reach. She shortened the distance like a gallant horse cutting through the wind. Continuing to dodge her sword fight, Kanata resumed his previous analysis on Misora. Her speed that could rush over in an instant seemed like an illusion. At least that was not something a F-rank squadron’s member could achieve. The speed of flying magic depended on the concept magic of realizing floating ability; Propulsion was gained by conversion of magic through magic control; The sense of reading the wind direction and shifting the center of gravity. These three inborn factors were said to determine the flying speed. Just being physically strong alone did not mean faster flight speed. Misora’s flying magic acceleration from initial speed to max speed was overwhelmingly short. This caused the opponent to misjudge the distance in between which caused the illusion. Then, what about the stamina? Although her shoulders were heaving up and down to catch her breath, she still seemed to have plenty of stamina, her speed also did not drop. Against Misora’s pursuit, Kanata gradually increased his altitude to escape, then grasped the timing to sharply tilt the tail of his Broom upwards. The upright Broom received a huge wall of air resistance, causing it to flip one round in the air. Kanata followed the flip, and instantly reversed the direction of advance. She was chasing him in a straight line with high speed, as a result they crossed each other and she could not catch him. She had the speed and the stamina, but her skill was lacking. Now then how about the remaining two? Kanata looked towards the direction where the two of them were, of course their figures were not there. However, he could sense another person’s presence nearby. Kanata immediately changed his direction after sensing the presence, and he could see Lecty who was looking up at him, timidly holding her magic twin swords at around her shoulder height, with the blade upright. Kanata pulled out a dagger from thin air, and made up his mind to engage Lecty in close-range combat directly. His reason for such judgement was Lecty’s twin sword stance. Just that. Being able to intimidate the opponent with stance alone had a high possibility of having the actual ability to match it. However, Kanata showed a confused look. Lecty’s continuous assault with her magic twin sword was somewhat strange. There was just something amiss. She would sometimes use sharp thrusts that surprised Kanata, but at times move stiffly like the gishi gishi, gasha gasha movement of an old wind-up doll. If those unnatural movements were removed, it would be a fluent movement like a butterfly dancing or a bee stinging. It would be like rehearsed dance steps performed on stage that reached the aesthetic territory of the sophisticated magic twin sword arte. Kanata noticed those minor abnormalities. In the midst of the sword fight against Lecty. Kanata muttered. He looked at Lecty after his mutter, and Kanata met her line of sight. Once that happened, Lecty’s face that was already a little red from embarrassment, dyed further red that would make people sympathize her and lowered her head, her movement became extremely dull as a result. While Kanata was wondering why she apologized, Lecty’s power became weaker and weaker, to the point of fighting with her head lowered. It became lacking in brilliance, her stiff movements worsened to the point it could not be called a magic twin sword style anymore. He suddenly felt a sting on his back. Kanata turned around based on his sharp senses, he saw Rico in the faraway sky raising a sniper rifle-shaped magic gun towards him. Then Rico aimed through the scope, and pulled the trigger. The magic bullet mercilessly flew towards Kanata. Kanata that grasped the situation at the last moment moved out of the bullet trajectory, but soon returned to the trajectory line. Behind him was Lecty who had just noticed the magic bullet and was rooted on the spot from the shock. Kanata concentrated himself after clicking his tongue. He slashed apart the white magic bullet with his dagger.at the right timing. It should not be easy to slash a bullet travelling at three hundred meters per second, but he did it effortlessly. He utilized his inner magic power to enhance his dynamic vision and reaction speed, grasping the magic bullet’s speed, and finally released the magic power that could negate the bullet. Rico muttered regretfully as she closed in. She did not release the second shot because she realized the difference in their power from the first shot. Kanata looked at Rico blandly after hearing that. But she just feigned ignorance. Kanata released a long sigh. With that, he had grasped the strengths and weaknesses of the three girls. At that moment, Misora finally caught up. And then for some time, Kanata continued onigokko with them. The changing room after training. After sweating out in the shower, Misora and the others were changing into their underwear. Irritation prevented Misora from reaching the hook in the middle of her back. She could not wear her bra properly as well. Lecty was sensitive to the atmosphere and wore her underwear without any problem, then she turned towards Misora. She bowed deeply in apology. Misora came back to her senses. She honestly apologized for her mistake. That’s right. That was the attitude a squadron leader should have, just when Misora was about to regain her composure. Getting her moment ruined, Misora stared at Rico hatefully. Rico was in the middle of changing, or rather, she had been bewitched by her figure in underwear from the mirror reflection just now, and had been admiring her figure since then. It was rare for Rico to give her a lifesaver, Misora had changed her opinion on Rico a little. Despite being foul-mouthed, Rico could still be considerate for others. Lecty just realized that she had misspoken, and anxiously covered her mouth. Misora whose anger had already reached her peak could not listen to anything. Sizzle sizzle sizzle sizzle. The air between Misora and Rico became disturbed. Lecty timidly interrupted them. This squadron with just three members seemed to have a long way to go in teamwork. Hello, Can i know where i can contact you in private? You can Find me on my Discord, same nick. I didn't read everything yet but I noticed that some words, mostly names, are missing. Like the surfboard's nickname and weapons names. Probably everything thing with ruby text like magic is missing too? Oh, sorry about that. I didn't notice yesterday but it seems blogger screwed up the text. Will fix it shortly. Do tell if you find more mistakes. thanks!